Want to know a secret to earning affiliate income? An attention-grabbing email sequence—one that combines the perfect mixture of value and promotion—to lure in customer after customer. However, many marketers, including Sammy, seriously struggle with writing winning emails. So, what do they do? They grab hold of copy and paste email content—aka a “swipe file”—from the seller so they can dive right into promoting affiliate offers. And does it work? Results like generating $2,517 in seven days on an affiliate promotion. We’ll dive into the details in this case study. But first, let’s introduce our action-taking marketer, Sammy Jackets! To say Sammy has quite a diverse background would be putting it lightly. He has lived in many different countries, speaks five languages, and has worked in a variety of different industries. But, the focal point of his experience is many years spent working in sales. Following his latest position—during which he learned the power of digital marketing—he decided to branch out on his own to launch a mobile app development service for small- to medium-sized businesses. And, after taking several courses from different marketing professionals over a period of two years, he recognized the true value he could bring to the table for those in need of his skills. Generate sales for a mid-ticket affiliate promotion. Yes, he could have continued to rely on email swipe files provided on JV pages—or, what’s otherwise known as a page, created by the advertiser, that provides useful resources for affiliates when promoting their offers. These copy-and-paste files are intended to be used to effectively market affiliate products and initiatives like a pro. Reason being, statistics show that email continues to be an extremely valuable component of the sales process. Sammy, however, wasn’t finding the swipe files to be as beneficial as he thought they should be because they were hardly helping him earn the conversions he wanted and needed. And, that’s where ScriptDoll comes in. How did Sammy discover just what he needed to get the job done? 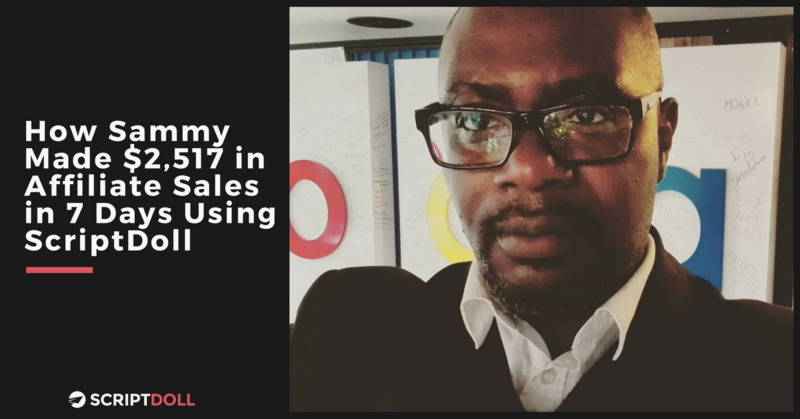 When he was gearing up to create his mobile app development service, he came across ScriptDoll and decided to purchase a membership to use the sales copy engine. Finally, something that would assist him with creating quality sales materials! As he found the need to push back the completion date for his new launch, however, he knew he didn’t want his subscription to go to waste. So, what did he do, even when he initially thought ScriptDoll was solely for product creators? He explored ways he could utilize the tool in his business configuration at the time—as an affiliate marketer. And, that brought him to the need to write his own emails (versus emails pulled from swipe files!) to differentiate himself from the rest of the pack of marketers promoting the same offer. Okay, what exactly did he need to do to get his hands on some copy for the affiliate promo? Sammy started browsing various ScriptDoll email templates and pinpointed the Pre-Launch to List Email Sequence as being the one he needed to use to sell to his subscriber list, which he’d been building for a handful of months. “[Pre-Launch to List Email Sequence] was the one that I thought was more suitable to email affiliate marketing promos because it answered all the client’s questions about a product. What is it? Why is it good for me? How much will it cost me? And what is the catch? From there, he was prompted to enter all the features and benefits of the affiliate promotion, information about the target audience, along with details that will help convey what they’re life would be like and what they’d get out of purchasing, into a new ScriptDoll product profile—a simple questionnaire of sorts. Once the product profile for this specific promotion was ready to go, the ScriptDoll sales copy engine took his responses and, using the template he selected, produced an efficient, compelling sequence of emails that told a story about the offer. All Sammy really needed to do was fine-tune the content a bit before dropping it into his preferred email platform for sending. Sammy continues to use the Pre-Launch to List Email Sequence to get results. We asked Sammy for one tip or tactic that was powerful for him that you could use. Great tip Sammy! Thank you for sharing your story with us and the ScriptDoll community. Want to follow in ScriptDoll user Sammy’s footsteps and get similar results for your business? Of course you do! Therefore, I invite you to become a ScriptDoll member and join an exclusive group of entrepreneurs who’ve found copywriting success and knocked their results out of the park. And, if you want to learn how to gather awesome testimonials like Sammy’s, grab our How to Raise Your Street Cred guide. All you need to do is enter your email address into the pop-up box on the right-hand side of your screen, and it’s yours. What did you think of Sammy’s results? Or, do you have questions about the script he used? Let us know in the comments section below. We’d love to hear from you and get you the answers you’re looking for!